A realistic detailed horrifying crouched howling skeleton wolf that's sure to scare all those who cross it's path! This frightening animated wolf is sound and touch activated. It let's out a menacing howl, then growls and barks, as its evil red eyes light-up and flash! Its skeleton bones are made of durable plastic and it's posed like it's ready to pounce on any trespassers. Animation & Sound: Menacing howl, then growls and barks as its evil red LED eyes light-up and flash! A realistic detailed horrifying crouched howling skeleton wolf that's sure to scare all those who cross it's path! This frightening animated wolf is sound and touch activated. It let's out a menacing howl, then growls and barks, as its evil red eyes light-up and flash! This life-size scary wolf prop measures 14" high and is 30" (2.5') long. The jaw can be opened to expose the vicious teeth. 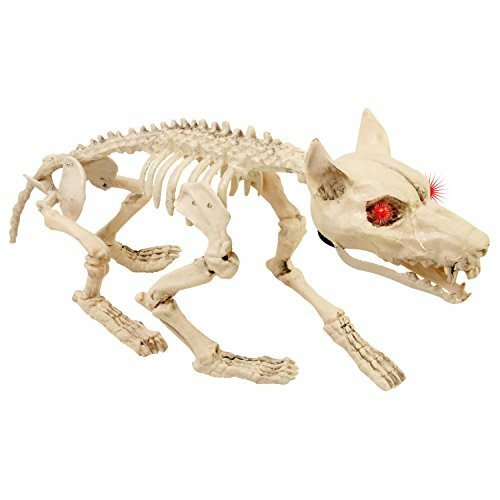 The wolfs skeleton bones are made of durable plastic and it's posed like it's ready to pounce on any trespassers. It's the perfect terrifying finishing touch to add to any haunted house, graveyard or entryway, as it will add a little more fright to a trick-or-treaters night!